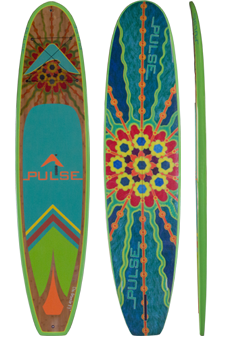 PULSE epoxy SUPs use high quality EPS foam and epoxy. The combination of these materials allows us to create the strongest, most lightweight and durable Epoxy SUP possible. All of our SUPs are constructed using a durable combination of three epoxy layers (one 6oz. layer and two 4 oz. layers) plus a graphic sheet on the top and two 4oz. epoxy layers plus a graphic sheet on the bottom over a 1.5 lb/ft3 EPS core. A final protective clear coat is applied and polished to give the final product a high gloss, attractive look. 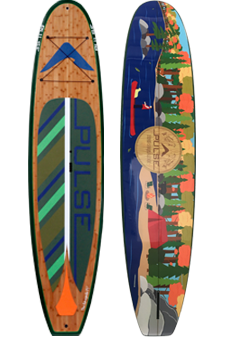 All PULSE epoxy boards feature a self breathing Gor-tex valve and offset handle for easy pick up/carrying as well as a 3 fin thruster set up for stability and tracking. We added a Go-Pro mount on the nose of the board and bungee tie downs so the paddler has the ability to capture those unforgettable moments. The traditional style SUP is our most popular design. Whether it be for an entry level flat water paddler, or your serious surf paddle enthusiast, we have a board to suit your needs.